French Orientalist; born March 28, 1849, at Château-Salins, Lorraine; died Oct. 19, 1894, at Paris. His parents were from a family established in Lorraine since the middle of the eighteenth century. 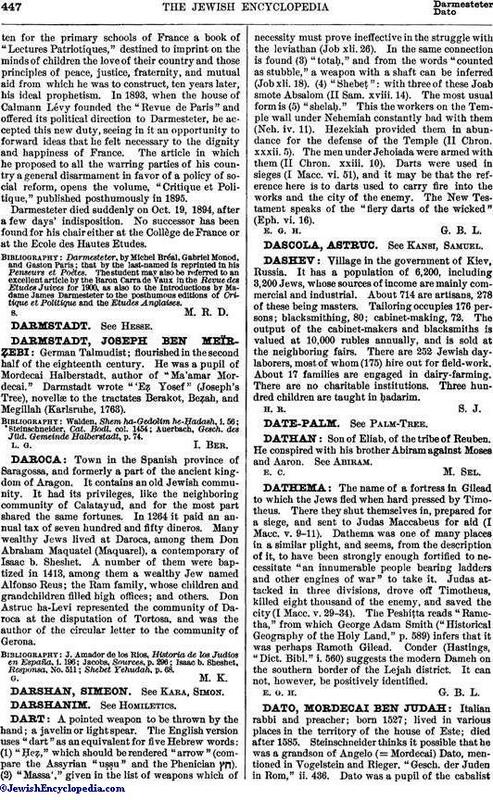 When, in 1791, the Jews of France were bidden to choose surnames for themselves, the great-grandfather of James selected the name "Darmstädter," in remembrance of the Darmstadt ghetto whence his parents had emigrated to Lorraine. The French registrar translated the name into his own language and wrote it "Darmesteter." Calmann and Cerf, the son and grandson of the original Darmesteter, were booksellers and book-binders in the town of Château-Salins; and there, in 1839, the latter married Rosalie Brandeis, the daughter of one of Napoleon's officers. The Brandeises, of Polish origin, were of a notable stock—rabbis, physicians, and soldiers through many generations. The family archives contain interminable series of rabbis. A great-uncle of the Darmesteters was physician to the Czar of Russia; their grandfather and their maternal uncles were soldiers or army doctors. From the Brandeises James and his brother Arsène inherited their love of letters, their scientific bent, and their enthusiastic patriotism. James was the youngest son. The eldest, Achille, a lad of uncommon promise, died suddenly one evening on his return from school, when Arsène was about six years and James about three years old. In 1852 the death of Calmann Darmesteter in Paris, leaving there a widow wholly unprovided for, gave Cerf and his wife a reason for moving to the capital; and with the widow they settled in the crowded quarter of the Marais. Work was difficult to procure; privations were many; and the close air and inappropriate food affected the health of James, who never grew to his full size, his stature being slightly deformed and his health always frail. He resembled in an extraordinary degree the illustrious poet of Recanati; and when he visited Florence in 1887 the Florentines dubbed him "Il piccolo Leopardi." With the tenacious idealism of the Hebrew race, the bookbinder and his wife, poor as they were, spared no sacrifice to afford their children a first-rate education. Both of them were grounded at the primary school of the Rue des Hospitalières, Saint Gervais; proceeding thence, on attaining their tenth or twelfth year, to the Talmud Torah, the seminary of the Jewish Consistory, a school whence most but not all of the pupils entered the Rabbinical College. At the age of eleven James obtained a Bischoffsheim scholarship; and thenceforth he followed the education of the Lycée, first at the Collège Charlemagne, then at the Collège Bonaparte (now CollègeCondorcet), the most prominent of Parisian public schools. 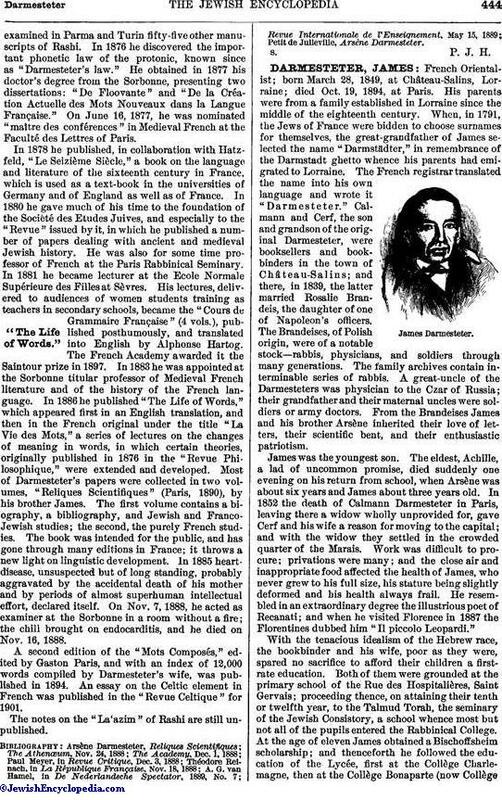 In after days he was wont to compare the "amiable and sterile education of the public school," much to its disfavor, with the original and somewhat chaotic system of the Talmud Torah; but it was partly to the classical discipline of the Lycée, and to its preoccupation with rhetoric and logic, that James Darmesteter owed his singularly beautiful style, at once lucid and suggestive, terse and admirably descriptive, elliptic and convincing. Darmesteter's school-days were a series of triumphs that terminated in the acquisition of the "Prix d'Honneur" at the general competition in 1867. On the morrow every school in France echoed with the Latin phrases which the delicate little Jew of eighteen had put into the mouth of the dying Demosthenes. After such brilliant school-days, Darmesteter showed a certain hesitation in deciding on his career. He obtained his baccalaureate in science and in letters, took the higher degrees in letters and in law, and then earned his daily bread by giving lessons. He had as yet published nothing. He had indeed begun a drama, a philosophical novel, a history of the satanic element in modern literature, and a synthesis of religions. But all these schemes were relinquished ere they neared completion. He fancied, as at his age Ernest Renan had imagined, that his gift was perhaps in the line of natural science. "But I studied only vague generalizations," he wrote later, "without that interest in details which is the beginning of wisdom. I wished to make a synthesis of the universe. I decided to employ nine years in research: a year for each science, following the order of Comte. In the tenth year I would write my book." Meantime he studied Byron in English, Heine in German, and Carducci in Italian. But ere the fourth year of his program was completed—a program loosely adhered to—one day, in reading Michelet's "Bible de l'Humanité," he heard the voice of the antique Orient: he had found his vocation. On the advice of Michel Bréal, Darmesteter in 1872 entered the Ecole des Hautes Etudes. He was not long a student. His rapid and surprising progress soon invaded the whole domain of ancient Persian literature, language, history, and religion. From the first he associated the life and the history of a people with the development of its language, and sought to interpret its faith by its traditions rather than by arbitrary philological comparisons. In order to understand the Avesta, he felt it important to study the inscriptions of ancient Iran, the legends of Firdusi's "Shah Nameh," the Pahlavi commentators of the "Bundahish," and even the rites of the modern Parsees of Bombay, rather than to compare the text of the Iranian Scriptures with the Holy Writ of ancient India, in the manner of certain German scholars. Each race, he felt, was, in matters of religion, more like itself throughout the continuity of its history than it was like any other race, however near a neighbor and contemporary. His "Haurvatât et Ameretât," published in 1875, proclaimed the student a master; and soon after he entered the Ecole des Hautes Etudes as professor. In 1877 his "Ormuzd et Ahriman" attracted the notice of F. Max Müller at Oxford; the eminent Sanskrit scholar entrusted to the young Frenchman the English translation of the Avesta for the collection of the "Sacred Books of the East"; and the same year Darmesteter went, for the first time, to England. While continuing his English edition of the Avesta, he contributed to the French reviews various essays and articles on points of historical and philological interest: these were collected in 1883 under the title "Etudes Iraniennes." The same year witnessed the completion of his English Avesta, of which the first volume had appeared in 1880. Darmesteter's translation of the Avesta had advanced him in the knowledge not merely of Persian, but also of English; and at one moment his increasing admiration for English literature went far toward robbing Zoroaster of his last and most brilliant disciple. But his devotion to his real career was too deep-rooted for any other interest to endanger it, though ever and anon the Orientalist paused in his more serious labors to publish an edition of "Childe Harold" (1882), a volume of "Essais de Littérature Anglaise" (1883), a classical edition of "Macbeth" (1884), a book on Shakespeare (1889), or to write the charming pages collected in his posthumous "English Studies" (1896). Few Frenchmen have understood England so intimately. Darmesteter, by a sort of happy guesswork, had divined the English character before he set himself to study it. 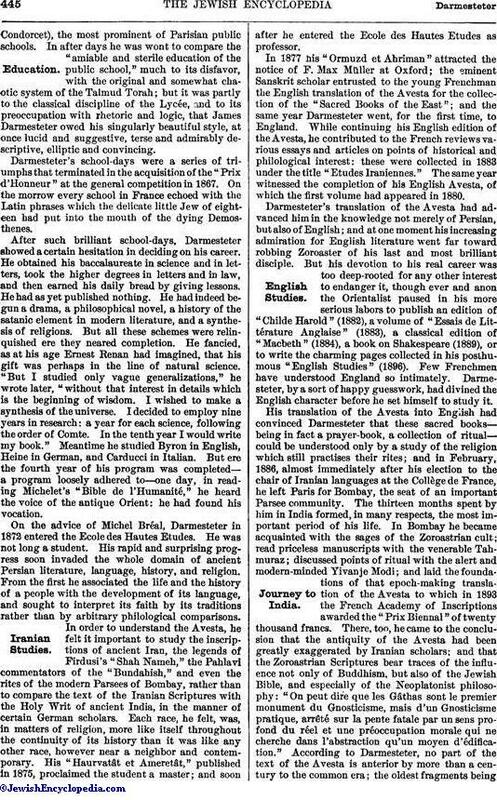 His translation of the Avesta into English had convinced Darmesteter that these sacred books—being in fact a prayer-book, a collection of ritual—could be understood only by a study of the religion which still practises their rites; and in February, 1886, almost immediately after his election to the chair of Iranian languages at the Collège de France, he left Paris for Bombay, the seat of an important Parsee community. The thirteen months spent by him in India formed, in many respects, the most important period of his life. In Bombay he became acquainted with the sages of the Zoroastrian cult; read priceless manuscripts with the venerable Tahmuraz; discussed points of ritual with the alert and modern-minded Yivanje Modi; and laid the foundations of that epoch-making translation of the Avesta to which in 1893 the French Academy of Inscriptions awarded the "Prix Biennal" of twenty thousand francs. There, too, he came to the conclusion that the antiquity of the Avesta had been greatly exaggerated by Iranian scholars; and that the Zoroastrian Scriptures bear traces of the influence not only of Buddhism, but also of the Jewish Bible, and especially of the Neoplatonist philosophy: "On peut dire que les Gâthas sont le premier monument du Gnosticisme, mais d'un Gnosticisme pratique, arrêté sur la pente fatale par un sens profond du réel et une préoccupation morale qui ne cherche dans l'abstraction qu'un moyen d'édification." According to Darmesteter, no part of the text of the Avesta is anterior by more than a century to the common era; the oldest fragments beingcontemporary with Vologeses, while the bulk of these Scriptures may be attributed to the reign of Ardashir (middle of the third century of the common era). But if the letter be relatively modern the spirit is ancient. The faith that Ardashir and his minister, Tansar, sought to restore and to reduce to writing was, even in their time, an inheritance from distant forefathers. This antique element persists in a great part of the doctrine of the Avesta—in the principle of dualism, for instance, as in the limit set to the duration of the world, in the final defeat of evil, and in the idea of resurrection—no less than in certain details of the ritual, such as the sacrifice of the sacred plant, the Haoma. In an elaborate introduction to the third volume of his French translation published by Leroux (Paris, 1893), Darmesteter brings the whole force of his philological knowledge and his historical method to bear upon this question of the origins of Zoroastrianism. In the present state of science some of the factors of the problem are lacking; but those existing have never been classified with so masterly a competence nor presented with such originality and grace as by Darmesteter. During his stay in India Darmesteter did not devote the whole of his time to the study of Zoroastrian tradition. He had left Europe with a mission from the French government to collect the popular songs of the Afghan tribes. On leaving Bombay he proceeded to the Northwest frontier and thence to the hills of Abbotabad. He who had made friends at Bombay with the Parsee priests might then be seen on the market-place of Peshawur talking with ragged mountain chiefs from Afghanistan or Baluchistan, or listening in prison to a poet in tatters—taken more or less redhanded—and writing down from his dictation some picturesque incendiary Pushtun ballad. These wild songs of border hate and love delighted the romantic soul of Darmesteter, while that other half of his mind, the scientific half, never asleep, noted strange linguistic forms and singular mutations of consonants, until, from a quantity of scattered details, he drew the unforeseen conclusion that in the language of the Afghan tribes there still survives the antique speech of the Medes. The Afghan tongue of to-day springs from Zend, as French springs from Latin. 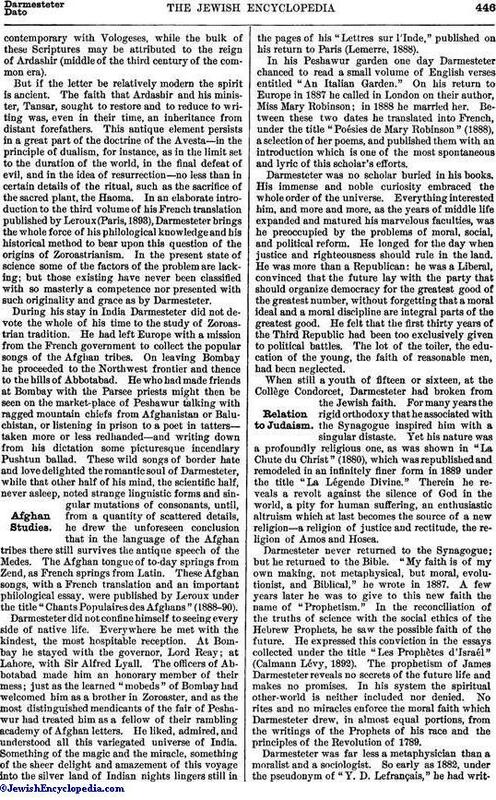 These Afghan songs, with a French translation and an important philological essay, were published by Leroux under the title "Chants Populaires des Afghans" (1888-90). Darmesteter did not confine himself to seeing every side of native life. Everywhere he met with the kindest, the most hospitable reception. At Bombay he stayed with the governor, Lord Reay; at Lahore, with Sir Alfred Lyall. The officers of Abbotabad made him an honorary member of their mess; just as the learned "mobeds" of Bombay had welcomed him as a brother in Zoroaster, and as the most distinguished mendicants of the fair of Peshawur had treated him as a fellow of their rambling academy of Afghan letters. He liked, admired, and understood all this variegated universe of India. Something of the magic and the miracle, something of the sheer delight and amazement of this voyage into the silver land of Indian nights lingers still in the pages of his "Lettres sur l'Inde," published on his return to Paris (Lemerre, 1888). In his Peshawur garden one day Darmesteter chanced to read a small volume of English verses entitled "An Italian Garden." On his return to Europe in 1887 he called in London on their author, Miss Mary Robinson; in 1888 he married her. Between these two dates he translated into French, under the title "Poésies de Mary Robinson" (1888), a selection of her poems, and published them with an introduction which is one of the most spontaneous and lyric of this scholar's efforts. Darmesteter was no scholar buried in his books. His immense and noble curiosity embraced the whole order of the universe. Everything interested him, and more and more, as the years of middle life expanded and matured his marvelous faculties, was he preoccupied by the problems of moral, social, and political reform. He longed for the day when justice and righteousness should rule in the land. He was more than a Republican: he was a Liberal, convinced that the future lay with the party that should organize democracy for the greatest good of the greatest number, without forgetting that a moral ideal and a moral discipline are integral parts of the greatest good. He felt that the first thirty years of the Third Republic had been too exclusively given to political battles. The lot of the toiler, the education of the young, the faith of reasonable men, had been neglected. When still a youth of fifteen or sixteen, at the Collège Condorcet, Darmesteter had broken from the Jewish faith. For many years the rigid orthodoxy that he associated with the Synagogue inspired him with a singular distaste. Yet his nature was a profoundly religious one, as was shown in "La Chute du Christ" (1880), which was republished and remodeled in an infinitely finer form in 1889 under the title "La Légende Divine." Therein he reveals a revolt against the silence of God in the world, a pity for human suffering, an enthusiastic altruism which at last becomes the source of a new religion—a religion of justice and rectitude, the religion of Amos and Hosea. Darmesteter never returned to the Synagogue; but he returned to the Bible. "My faith is of my own making, not metaphysical, but moral, evolutionist, and Biblical," he wrote in 1887. A few years later he was to give to this new faith the name of "Prophetism." In the reconciliation of the truths of science with the social ethics of the Hebrew Prophets, he saw the possible faith of the future. He expressed this conviction in the essays collected under the title "Les Prophètes d'Israél" (Calmann Lévy, 1892). The prophetism of James Darmesteter reveals no secrets of the future life and makes no promises. In his system the spiritual other-world is neither included nor denied. No rites and no miracles enforce the moral faith which Darmesteter drew, in almost equal portions, from the writings of the Prophets of his race and the principles of the Revolution of 1789. Darmesteter was far less a metaphysician than a moralist and a sociologist. So early as 1882, under the pseudonym of "Y. D. Lefrançais," he had writtenfor the primary schools of France a book of "Lectures Patriotiques," destined to imprint on the minds of children the love of their country and those principles of peace, justice, fraternity, and mutual aid from which he was to construct, ten years later, his ideal prophetism. In 1893, when the house of Calmann Lévy founded the "Revue de Paris" and offered its political direction to Darmesteter, he accepted this new duty, seeing in it an opportunity to forward ideas that he felt necessary to the dignity and happiness of France. The article in which he proposed to all the warring parties of his country a general disarmament in favor of a policy of social reform, opens the volume, "Critique et Politique," published posthumously in 1895. Darmesteter died suddenly on Oct. 19, 1894, after a few days' indisposition. No successor has been found for his chair either at the CollÈge de France or at the Ecole des Hautes Etudes. Darmesteter, by Michel Bréal, Gabriel Monod, and Gaston Paris; that by the last-named is reprinted in his Penseurs et Poètes. The student may also be referred to an excellent article by the Baron Carra de Vaux in the Revue des Etudes Juives for 1900, as also to the Introductions by Madame James Darmesteter to the posthumous editions of Critique et Politique and the Etudes Anglaises.